Today's post is all about the most powerful animal in ancient Egypt: the hippo. Ancient Egyptians were deeply attached to the animals that existed all around them. Their gods reflect this in the fascinating way their religion blended animals and humans together. Many animals were feared and yet also worshiped. Some animals, like dogs and cats, were pets. Some animals were so cared for that they were even mummified. Don't be fooled by my cute ears . . .
One cannot but help but be impressed and awed by the hippo's unique form. They may not be classically beautiful, but they have a power and strength that is impressive to behold. It is no wonder they hold such a high place in Egypt's history. The hippo was one animal that Egyptians worshiped as a goddess, but it was also the most feared animal in ancient Egypt--and with good reason! Hippos are enormous, and their jaws and teeth are powerful crushing tools that can break a person's bones with ease. Hippos can stay under water for some time, and this proved disastrous for fishermen and boaters, for who knew when and where a big hippo would surface? A hippopotamus could overturn a boat as it came up out of the water, and people were often injured by these huge yet noble creatures. Did you know hippos can even run faster than humans? 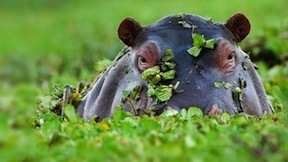 Hippos also had a habit of munching on fresh wheat crops and trampling farmers' fields. Here's a fascinating fact about hippos: it's said that Egypt's first pharaoh, King Menes, also known as Pharaoh Narmer (read 10 facts about Narmer here) may have been killed by a hippopotamus. On the flipside, the hippo was also worshiped in the form of a goddess. 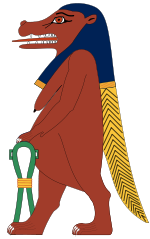 Her name was Taweret, and she had the body of a woman, the head of a hippo, and the back of a Nile Crocodile. Taweret was a protective goddess who watched over pregnant women and new mothers. Some of her nicknames are "Lady of Heaven" and "Mistress of Pure Water." Given her power, it's no wonder mothers wanted Taweret on their side. A goddess with such strength could be very helpful at defending mothers and children. 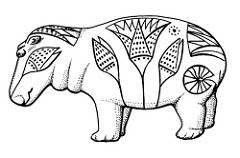 Below, I've included this great 8.5 x 11-inch printable coloring page of a hippopotamus. It was artistically rendered by Paul K at Bibliodyssey with Egyptian symbols of the lotus flower. Print this one out and have some fun coloring it in. So there you have it, some fascinating information about the hippo in ancient Egypt! Thanks to Alexa for her great suggestion. More animal posts coming soon.